I've created a number of control systems over my career. Most of them have controlled moving vehicles, like airplanes or rockets. But some have controlled other systems. In 1989 I was part of a very small team that developed the world's first fully autonomous UAV control system. 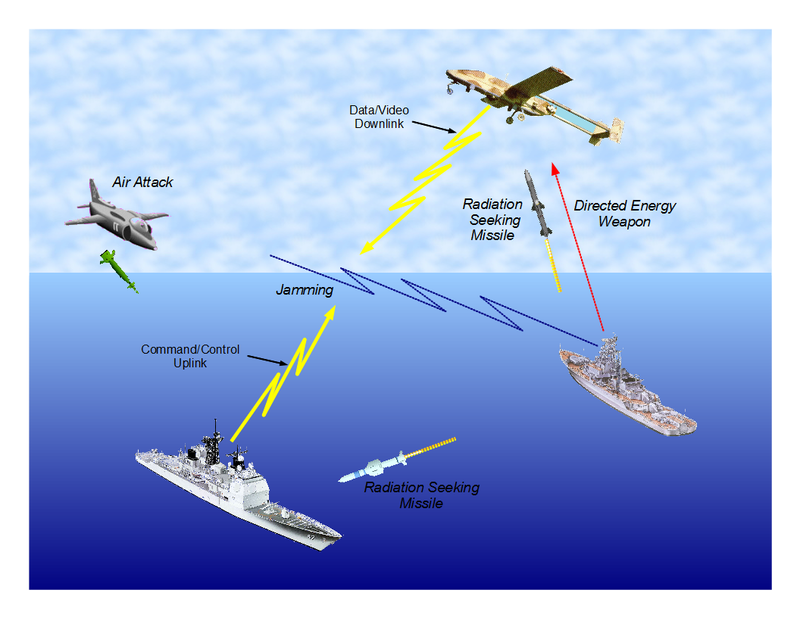 The system was called the Sensor Driven Airborne Replanner (SDAR). At that time, the Navy was flying Pioneer UAVs (the airplane in the masthead at the top of the page) off of the battleship USS Wisconsin, BB-64. The UAVs were used for artillery spotting and over-the-horizon search for enemy ships. At that time, the UAVs were controlled through a continuous radio uplink to the aircraft. The aircraft operated a continuous radio downlink to carry both data and video back to the operators. Nearly all UAVs are still operated this way. The problem with this technique is illustrated in the figure to the right. (Click on any image on the page for a larger version.) The radio links are susceptible to jamming, act as beacons announcing the ship's presence, and as localizers for any radiation-seeking weapon. We figured out how to embody the intelligence of the ship-based mission-planner, pilot and camera operator into the aircraft, eliminating the need for both the control and data links, so that the UAV could operate covertly. We did it by creating a control system that could fly the aircraft as well as any pilot, topping that off with a real-time artificial intelligence (AI) system that could make high-level decisions, replanning the UAV's mission as data came in. With this kind of intelligence on board, the UAV could fly a complete mission autonomously and covertly, collecting the mission planner's desired data without any input or contact from the surface. The SDAR system was essentially a heirarchy of feedback control systems. At the base, connecting the SDAR system to the aircraft, I created a bank angle-, altitude- and airspeed-command autopilot. This is what flew the aircraft. Above it, we wrote a set of heading-, course- and track-command navigational control algorithms. These allowed us to, for example, command the airplane to fly a track between two points. Finally, on top, we had the artificial intelligence system, which took in sensor data, made decisions on what to do next to perform the mission and then sent guidance commands to the navigation algorithms. For more detailed information on the system, here are a few papers I've written on the system plus a video of SDAR in action. A paper I wrote for a computer programming conference that describes the SDAR system and what it does. 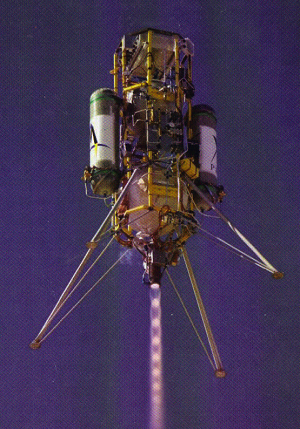 A white paper showing SDAR flying a simulated mission. This paper goes into good detail on how SDAR works its way through a mission. A paper on the hardware-in-the-loop simulation that I wrote for the development of the SDAR system in the lab. A video of the SDAR system flying a simulated mission. At Masten Space Systems, I developed Guidance, Navigation and Control (GN&C) systems for the company's vertical takeoff/vertical landing rockets. Masten's vehicles are designed to take small payloads to high altitude, where they can be outside most of the Earth's atmosphere and where they can experience a short period of near-zero-g flight. Upon reentry, the rocket can relight its engine, right itself, make a controlled descent under rocket power and return itself and the payload back the launch point, for a soft landing. Masten's rockets have no aerodynamic control surfaces, and so all control over the vehicle is exerted by vectoring the thrust of the single, gimballed engine. I developed a new set of control laws for Masten's "Xaero" vehicle. With those new laws in place, the vehicle exhibited improved accuracy in its position and velocity control during autonomous flight. MCI's Site Controller is a mission-critical system that is located in every phone network hub around the world. Its job is to control and communicate with the network equipment that forms the backbone of the telecommunications network. The diagram at the right shows how the system fits in. 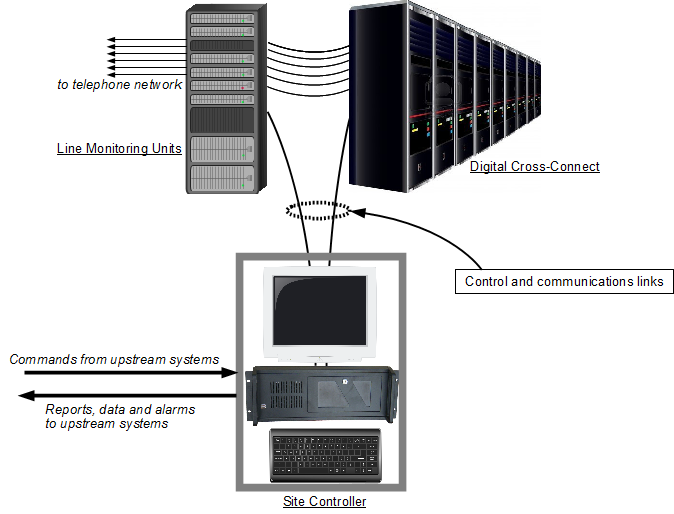 The central piece of equipment in the phone system is the Digital Cross Connect (DXC). This is the machine that connects disparate phone lines to form an end-to-end, continuous connection. Every network hub, or "site", has one or more DXCs located inside of it. In addition, line monitoring units (LMUs), which sample the digital signals passing back and forth, are placed on each digital phone line entering the site. The Site Controller communicates with and controls the DXCs and LMUs in real time. Upstream systems, whose jobs involve provisioning the phone network, collecting performance information and collecting alarms, do all of their work through the Site Controller. These systems open a session with the Site Controller and then send commands to schedule performance reports and manipulate the DXCs or LMUs. The Site Controller complies by remembering what each session has requested, sending commands to the network equipment, collecting data at appropriate intervals, and sending that data to the upstream systems. I created four Site Controller releases. For Release 11.0, I gave the system the ability to operate E1 (European standard) Line Monitoring Units. MCI was very good at recognizing critical systems and allocating resources to ensure their dependability. Each release of the Site Controller underwent three separate and increasingly stressful test regimens. First, our local, System Test group wrung it out in our local lab. If it passed their tests, it went to the Network Equipment Lab (NEL) in Richardson, TX, where it was stressed under a full load of site equipment carrying synthesized traffic. If it passed NEL's testing, it went to a single site in the field, under the watchful eye of the Field Verification Office (FVO), where it worked under real conditions with equipment carrying live traffic. If it passed FVO, it was released to the field. After the System Test people finished their examination of Release 11.0, I found myself greeted in the hallway with congratulations and handshakes. They were able to find 6 minor issues with the system. They were used to a typical count in the twenties. With those errors fixed, The release passed through both NEL and FVO without a single additional issue coming to light. For Release 12.0, I gave the system the ability to operate the Alcatel 1633 DXC. It passed through all testing without a single issue arising. For Release 13.0 I gave the system the ability to be reconfigured on the fly. And for Release 14.0, I gave the system the ability to operate the Alcatel 1631SX DXC. When I created that release, the 1631SX was still under final development, and so we didn't have one to work with. Its design was final, however, and so I wrote a program that turned a PC into a hardware emulator of the DXC. Using it, I was able to complete development of Release 14.0 very quickly, before the hardware was released. Releases 13.0 and 14.0 also passed through all testing without a single error being found. I was very pleased to receive a note of commendation from the System Test group for my work.